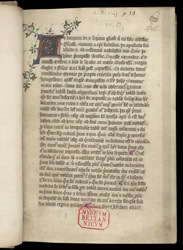 The computistical materials at the beginning of this manuscript were drawn up in 1380 at the request of the mother of Richard II, Lady Joan Holland. It used to be thought that this was the original presentation copy made for Joan, hence the name the 'Princess Joan Psalter'. Two of its historiated initials are by Joannes, one of the leading artists of early 15th-century London. This preface states that the following tables were drawn up in 1380 by John Somer (lines 8-9), at the request of Lady Joan (lines 3-4). This part of the manuscript is a copy, added about half a century after her death.